Rotterdam main station, which is still under reconstruction. The previous station (1847) was demolished. One of the advantages living in Europe is that we can easily visit many countries as long as it is still included in Schengen area. Fortunately we lived in Aachen in the westernmost part of Germany which borders on both Belgian and the Netherlands. This winter, the dutch groceries shop (kruidvaat) in the nearest city (Vaals) offers cheap train tickets around the Netherland for only 12,50 euros. This ticket valid for one day in the weekend. 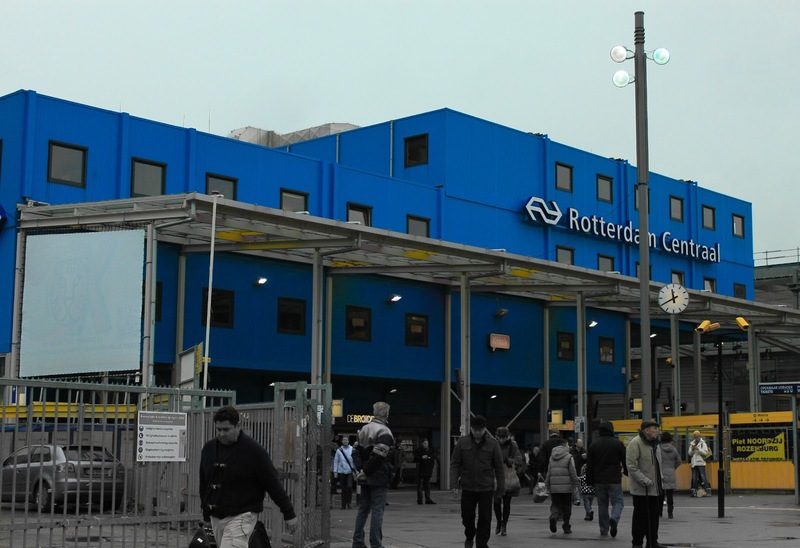 Therefore, we took this opportunity to go to Rotterdam which is located in the west part of the Netherlands. Unfortunately, the ticket only valids in the dutch train. therefore we needed to buy additional bus ticket for a day in South Limburg. We took a bus No 50 from Aachen Schanz to Maastricht (alternatively, we could go via Heerlen but the disadvantages's, we had to change trains 3-4 times). From Maastricht, we could already use the train in direction to Eindhoven and changed the train there to go to the Rotterdam Centraal (Rotterdam Main station). The journey only took about 3 hours from Aachen, and it seems that many people were traveling using train.. it's crowded.